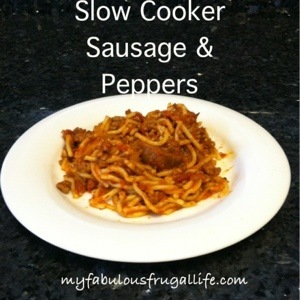 My slow cooker sausage and peppers recipe is not only fast and delicious; it is also healthy and low-fat by substituting turkey Italian sausage for traditional pork sausage. This is one of my favorite and easiest dinners to make! 1. Slice peppers and onions. Place in slow cooker. 2. Empty sauce and tomato cans into slow cooker. 3. Add garlic and stir mixture. 4. Place sausages in slow cooker, cover with sauce mixture. 5. Set slow cooker to low and cook for a minimum of 5 hours. 6. Combine with your favorite pasta and dinner is ready. 7. I remove the sausages, slice, and stir into the pasta before serving. You will come home to the amazingly delicious aroma of sausage and peppers! 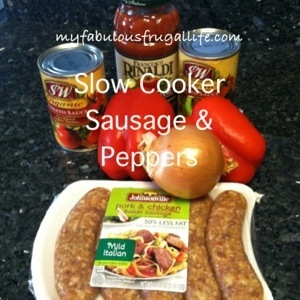 Give slow cooker sausage and peppers a try! 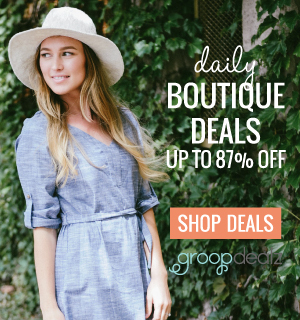 Thanks for the mention :) Can’t wait to try some of your recipes! You’re welcome! Keep posting awesome recipes! Kudos for sharing this with us. You definitely know what you’re speaking about. Looks good! I’m trying this out tonight!